London, 6 February 2014. UK-based independent Acamar Films today announced that it is working in partnership with both leading Irish animation studio Brown Bag Films and London based Tandem Films to coproduce the much-anticipated new animated series Bing Bunny – based on the hugely popular books by award-winning author and illustrator Ted Dewan. Acamar will be launching the new show with initial episodes available to view at MIPTV. 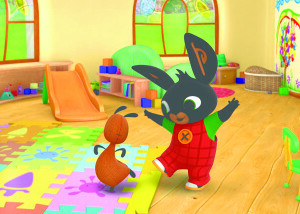 The 78 x 7’ series has been meticulously developed for internationally renowned BBC pre-school channel CBeebies, which will be bringing the Bing Bunny books’ unique philosophy and story-telling to television audiences this spring. A number of key global broadcasters are also on board with sales to be announced imminently. Acamar is developing a high-quality global publishing, licensing and digital campaign for Bing Bunny with several market-leading partners already on board. A multi-territory representation agreement has already been signed with award-winning TLC (The Licensing Company) to develop Bing Bunny with key partners around the world. Acamar and TLC have already appointed leading international children’s publisher Harper Collins to produce a major multi-format TV tie-in programme for Bing Bunny as well as to re-issue the entire series of Ted Dewan’s original classic “Bing” books. The first of these re-issues occurred in the UK in August 2013, and the second in January 2014, with further book launches planned for the coming months. Acamar’s CEO, and industry veteran Mikael Shields, has hand-picked the team to bring Bing Bunny to the screen. The project is being series directed by Academy Award-nominated Director Nicky Phelan at Brown Bag Films, series story direction is by Jeroen Jaspaert at Tandem Films, and music for the project is coming from award-winning composer Julian Nott. Lucy Murphy, who has held key roles at King Rollo, EVA Entertainment and Novel Entertainment, is on board as executive producer along with former MD of Nickelodeon UK, Howard Litton, also an executive producer. “Bing Bunny is a very special project for us here in Brown Bag Films; we helped develop and design Bing’s supporting cast in the early development stages, and are now in full swing of episodic production. Working with Acamar and Tandem has been a thoroughly collaborative and rewarding endeavor. To bring Bing to the screen, we are utilizing high end CG and have an incredibly talented and committed team of artists and production staff in Brown Bag putting their extensive experience in to creating a series we believe Bing’s audience will truly love. “We came on board for the initial pilot of Bing Bunny, and I was immediately captured by the refreshing, rich quality of the storytelling, so we were delighted to be able to work on developing the story and animatics for the full season. I wanted to portray a quirky world that had a sense of wonder, but was always recognisable, honest and immersed in realism, ensuring the emotional narrative present in the books was preserved. Bing Bunny celebrates the real-life experiences of young children and the grown ups in their lives in a most authentic way. Bing Bunny is about celebrating the mishaps, mess, energy and wonder of being a relatively new human being with the reassuring exclamation: “It’s a Bing Thing!”. Each 7-minute episode is a thoughtfully written ‘micro-drama’ which explores what life is really like for a pre-school child; from taking a bath to making a smoothie, these small stories, told onscreen in real-time, and from Bing’s point of view, make for compelling and affecting drama. The series stars Bing Bunny and his learned, ageless carer and best friend Flop, along with a ensemble cast of Bing’s close friends and the grownups in each of their lives, all of whom have been specially developed by Acamar for television. Pre-school life is certainly dramatic. So why isn’t pre-schooltelevision? Most pre-school TV is artificially bright and jolly.What would it be like if pre-school TV authenticallydramatised pre-schoolers’ experiences, celebrating themishaps, mess, energy, and wonder? The Bing books broke new ground, addressing pre -schoolers and adults with “micro-dramas” about their every day lives together.We’re producing something just as ground-breaking for pre-school TV in a formatthat tonally feels like real-time 6-minute video clips on YouTube (without thepushy parents off-camera). Characters speak naturally and authentically for theirage, the laws of physics apply (no magic or fantasy) and we don’t shy away fromuncomfortable feelings or events. Acamar Films was founded in 2005 to create and produce premium quality film and television projects. Its CEO Mikael Shields has over 25 years’ experience and an international reputation for identifying, developing, financing and producing a wide range of hit film and television projects including Nick Park’s Wallace & Gromit, Aardman’s Rex The Runt, Candy Guard’s Pond Life, Pingu, Noddy, Hilltop Hospital and Flatworld. He has held senior management positions at the BBC, EVA Entertainment, Pearson, Atom Films and Ealing Studios. Ted Dewan is an award-winning author and illustrator and creator of Bing Bunny. Born in Lexington, Massachusetts, Ted’s professional illustration career began at the age of 16, when he received his first book commission. He moved to the UK in 1988 and after becoming a father he decided to dedicate most of his time to writing and illustrating books. Bing Bunny came about when he realised he felt that so much children’s literature is saccharine and untrue, and what he really wanted to read to his daughter were books that ‘told It like it is’. And so Bing Bunny, featuring all the highs and lows of everyday toddler life and a ‘Don’t worry, it’s a Bing thing!’ philosophy, was conceived. About Brown Bag Films: Brown Bag Films® is a global leader in children’s and family entertainment. Millions of kids watch their series every day in over 150 countries. Brown Bag Films® is currently producing four of the world’s highest rated pre-school shows including Doc McStuffins, Henry Higglemonster, Peter Rabbit and Octonauts. As well as Emmy and BAFTA nominations for its TV series, the studio has been awarded two Oscar™ nominations for its short films Give Up Yer Aul Sims (202) and Granny O’Grimm’s Sleeping Beauty (2010). With over 20 years’ experience, Brown Bag Films® remains a creatively-owned and managed studio with headquarters in Dublin and operations in Los Angeles. Using technology to tell stories, Brown Bag Films® has built its own picture and audio post-production facility. Its Technology R&D department is focused on consistently increasing operational efficiency and developing the studio’s cutting edge digital infrastructure. About Tandem: TANDEM was formed by two directors Daniel Greaves ad Nigel Pay who were later joined by producer Mike Bell. After winning the Oscar™ and over forty international film awards for Manipulation, TANDEM went on the produce the BBC 30-minute special Flatworld which also won dozens of awards and was nominated for a BAFTA, followed by another BAFTA-nominated, multi-award-winning short film Little Things. Daniel Greaves is just finishing his latest film Mr Plastimime, a film that mixes stop-motion clay animation, with CGI and 2D to great effect. These successes allowed the studio to establish an international reputation for craft-led award-winning advertising production including campaigns for Honda, Ribena and Marmite. TANDEM now represents a roster of fourteen award-winning animation directors working in every conceivable style and technique. Based at a large facility in North London, TANDEM incorporates a drawing studio, CG department, motion-control studio facility, digital editing suite and sound facility.